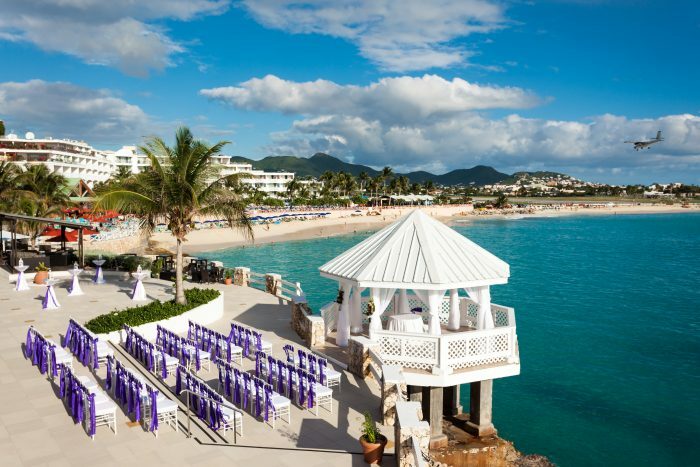 Located in the nightlife capital of St. Maarten, you will find the beautiful Sonesta Maho Beach Resort on the stunning south shore of St. Maarten, ideal for a memorable wedding ceremony. 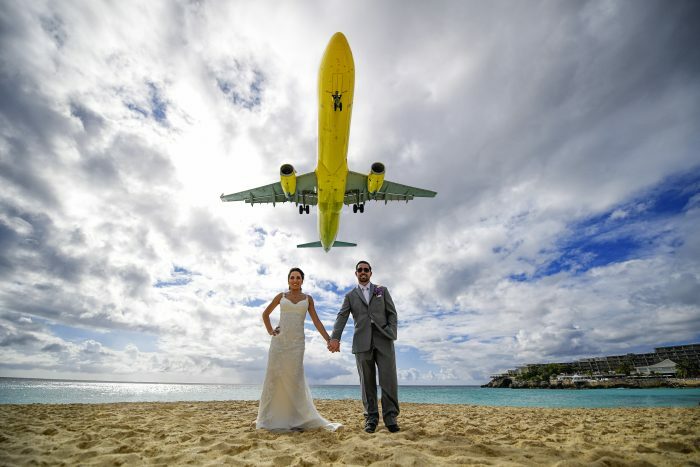 A destination wedding could contain excitement or relaxation around every corner depending on which you desire most, with access to nightclubs and St. Maarten’s largest casino, along with cascading waterfalls and direct entry to iconic Maho Beach, world famous for the jets that land directly above it. World famous Maho Beach is nearby, which means airplanes flying directly overhead! Think about whether that is a pro or con for your group. All-inclusive options are available for your guests to choose from. Children 5 and under stay for free under the all-inclusive plan. 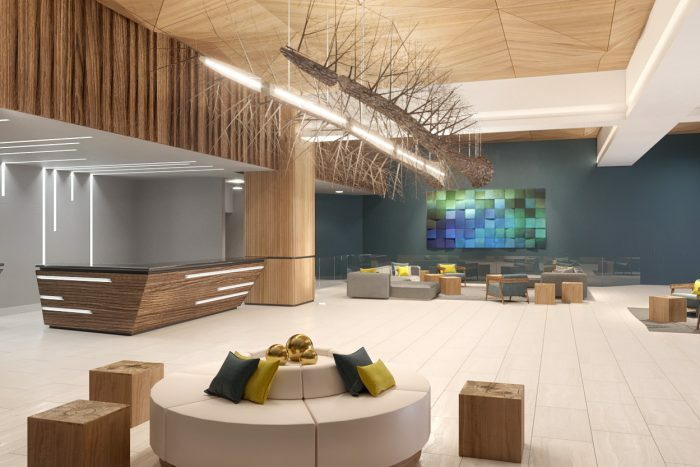 The resort is recently renovated and sparkling new, with upgraded rooms, decor and amazing new details throughout the service and restaurants. Free package is available when 10 rooms are booked for a minimum of 5 nights each. Book as little as 50 room nights for your family and friends as part of your wedding group and receive free inclusions. The more room nights booked, the more freebies you and your guests get to enjoy! Alacarte weddings are available. Upgraded packages, additional guests, and add-ons are available for an additional cost. Maho Ballroom – 500 guests max, Royal Pavilion (indoor) 200 guests max, Royal Pavilion (terrace) 200 guests max, Point Gazebo – 150 guests max, Palms Upper Beach – 100 guests max. 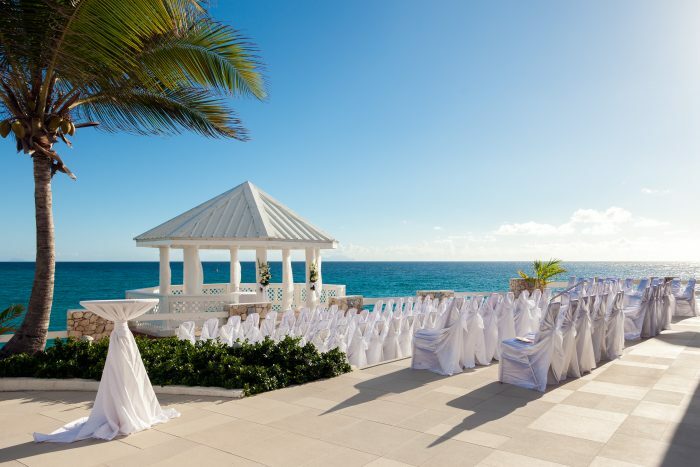 The Sonesta Maho hosts up to 3 weddings per day maximum. There are 466 rooms with resort and ocean views. The resort is able to accommodate mobility-impaired guests. 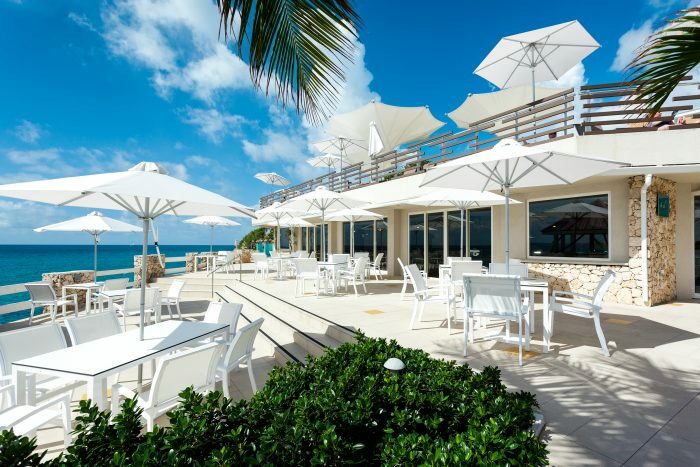 High seasons for St. Martin, where hotels often experience occupancy sell-out, are January through April and July. We highly suggest booking with at least 6 months in advance. This hotel allows a maximum of 3 adults per room or 2 adults and 2 children 13 or younger per room. The resort is located 1 miles from the SXM airport. Book as little as 50 room nights for your family and friends as part of your wedding group and receive free inclusions. The more room nights booked, the more freebies you and your guests get to enjoy! Alacarte weddings are available. Upgraded packages, additional guests, and add-ons are available for an additional cost. $125 – $165 price per person per night, based on entry level 2 adult occupancy. Rooms include private balcony or terrace, coffee/tea maker, Free Wi-Fi, flat screen TV, and rain showers. There are 420 rooms with resort and ocean views. The resort is able to accommodate mobility-impaired guests. 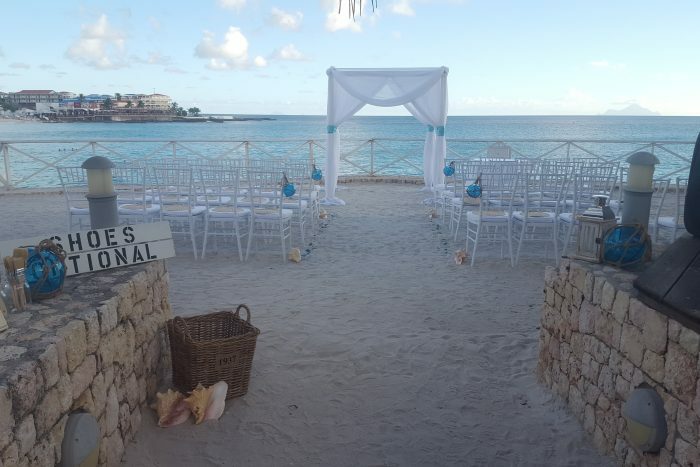 Sonesta Maho Beach hosts 1 wedding per day. 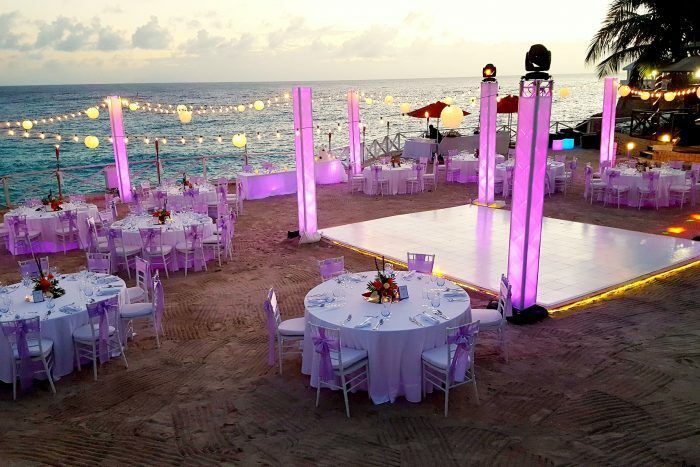 The Sonesta Maho wedding department typically responds within 24 hours. The resort is located 1 mile from the SXM airport. “My fiancee and I just returned from our destination wedding at the Sonesta Maho Resort & Casino, and could not be happier! We went into the planning process with a lot of questions and were a bit nervous with not being able to see the venue beforehand, but Katlyn, Maressia and Mahadavi were great – they were incredibly helpful, right up until the end of the night. The resort provided a wedding planner and photographer that we were very happy with, and our photos were handed to us on a USB before we even left the resort! The day was beautiful and our whole family had a fantastic week. “Where to begin – this wedding has been a dream come true for my wife and I. 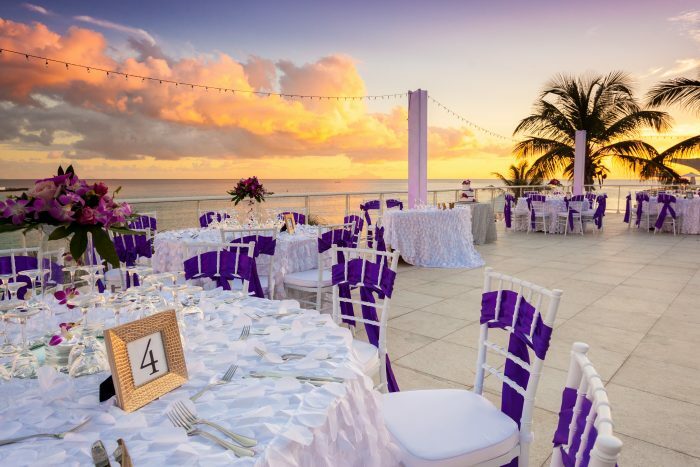 Our guests were in complete ‘awe’ with the venue which our ceremony happened at (on the beach overlooking the ocean). From start to finish everything ran smoothly and occurred just as planned. Thank you so much to the wedding staff which included Katlyn, Annemiek and Mahadavi whom were not only very professional but most importantly very attentive and helpful. These ladies definitely took a ton of stress off our shoulders and helped made our wedding day a very memorable and special day.